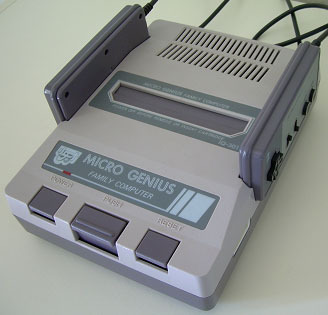 The Micro Genius Family Computer is a pirate console made by Micro-Genius, a Taiwanese company. It’s a Famiclone, but not a legal one because it was made prior to 2003, when Nintendo’s patent on the Family Computer officially expired. This console is very much like the Family Computer. It’s a toploader that has an automatically closing spring door to protect its contacts from dirt and grime. That’s certainly an improvement on the original Famicom’s design, which forces you to manually open and close the protective flap. Another improvement over the Famicom is a red LED that lets you know when the power is on or off. The cart also has an eject button you push down instead of sliding back. The Famicom’s sliding eject button is often unhelpful. The controllers are directly wired into the console, like the Famicom, and the additional controller port is on the side instead of the front. Neither controller, called “joysticks,” have a microphone, but they both have turbo settings. 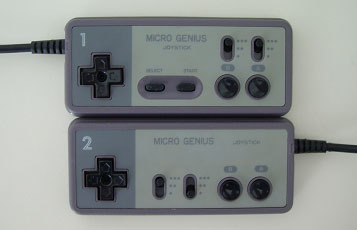 It seems like Micro-Genius took the Famicom’s design and attempted to improve it. The Micro Genius Family Computer comes boxed, but like any retro console these days, it’s easier to find loose. If there ever is a reason not to buy a foreign console, it’s because of how different (and therefore difficult) the television and power outlet specs can be. While it’s ture some Famiclones were manufactured and marketed in the United States, most Famiclones made before 2003 have different specs. Expect to pay anywhere from $10 to $50 for a Famiclone, depending on how closely it mimics the Famicom or whether it’s portable. The sleek Micro-Genius Family Computer.